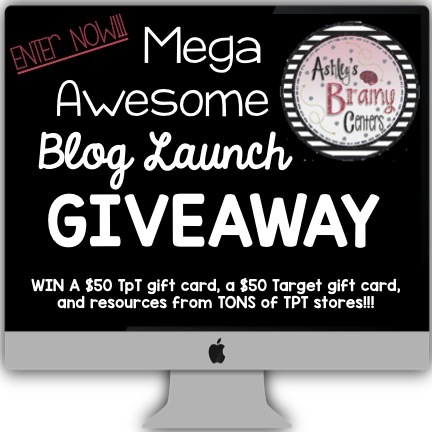 I'm super excited to help celebrate Ashley's Brainy Centers Blog Launch w/ this amazing GIVEAWAY! She, along with several other awesome Teacher-Authors, came together to support the blog launch by donating some incredible products from their TPT stores. In addition, you can enter to win a $50 TPT gift card AND a $50 Target gift card!!! The best part is that it's completely paperless, meaning you can access it through Google Slides. If you would like to print instead, you can also print directly from Google Slides. Good luck and head on over to Ashley's Brainy Centers to enter! Thank you for helping and getting the word out for this!